Easter Sunday | Social English Class. It is the day of the of Jesus's resurrection and Easter Sunday is celebrated, the typical desserts are Easter eggs, this tradition comes from old Egyptians, according to the place of the celebration the desserts are of traditional eggs, of hot buns, cakes with the chocolate and egg decoration… it is also a day to meet with the family and the godfather gives the Easter cake to its god-daughter/son, mainly in Catalonia. 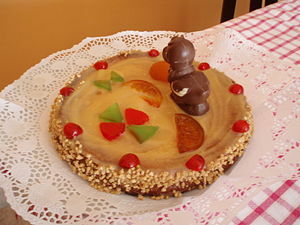 In some places like Catalonia that day is celebrated on Monday, known as Easter Monday. It is the day of the resurreción of Jesus and the Sunday of Passover is celebrated, the typical desserts are the Passover eggs, that traditionally this custom comes from old the Egyptians, according to the place of the celebration the desserts are of traditional eggs, of buns of burned bread, cakes with the chocolate egg decoration… Also it is a day to meet with the family and the godfather gives the monkey to its goddaughter, mainly in Catalonia.